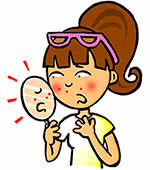 Acne is a skin disease consisting of blemishes that can occur on your face, neck, chest, shoulders, and back. Atopic dermatitis (usually referred to as eczema) is a common condition that affects roughly 3 to 8% of the population. Most adults are likely to have experienced acne at some point in their lives.